Ex-Christadelphians: WHERE NEXT FOR CHRISTADELPHIAN EVOLUTIONARY CREATIONISM AND THE CD ACADEMICS? WHERE NEXT FOR CHRISTADELPHIAN EVOLUTIONARY CREATIONISM AND THE CD ACADEMICS? Christadelphian Evolutionary Creationism is a derivative of a 16th Century Reformation idea pioneered by John Calvin. It was originally called "Divine Accommodation." The problem faced by the 16th Century Protestant Reformers was that the previously accepted (Biblical) idea of Geocentricism (the Sun revolves around the Earth which is at the centre of the universe) was being overturned in favour of the correct (Copernican/Galilean) scientific explanation that the Earth revolves around the Sun. Ideally the reformers should have accepted the obvious truth that because the Bible had been proved to be wrong on a fundamental principle of astronomy, then it should be rejected as not being the word of a supernatural all knowing God. But because Europe was firmly under the mass delusion of Christianity, and adherents were scared of eternal torment in Hell's fires, they had to accommodate Biblical error to scientific truth. To an objective outsider, this sort of semantic acrobatics is an obvious cop-out from people who have lost the argument, but who don't want to admit that they have been beaten. The Bible is full of the erroneous mistakes of the time in which it was written, so they pretend that God deliberately inspired the writers to write errors, so that the readers would accept them. That this argument is nonsense can be illustrated by the fact that the Ancient Greeks surmised that the basic constituents of matter were atoms. It was an incredibly insightful claim over two thousand years ahead of its time. The Bible contains nothing like this sort of wisdom. Instead God is supposed to have inspired humans to write mistakes in his book! In the 19th Century the work of Charles Lyle showed that the Bible was also wrong about the Earth being only six thousand years old and instead it was many millions, if not billions of years old. Once again the principle of Divine Accommodation was used to re-interpret the Bible to pretend that there was a "gap" between the first two verses of the Bible and therefore the Earth was created tens of millions of years prior to God's creation, which was more of a sculpting of a previously existing Earth. Late in the 19th Century Darwin's theory of Evolution showed that the Bible was also wrong about the creation of the different species of life on Earth. In truth they had arisen as a result of Evolution. In other words, each time the Bible is shown to be fallacious, the Biblical apologists, who refuse to accept that the Bible is the work of ordinary humans with limited knowledge, stretch the meaning of the words of the Bible to try to accommodate newer human knowledge and understanding that contradicts the Bible. Just as academically minded Christadelphians have beaten a long slow, one hundred and sixty five year retreat from Biblical literalism and fundamentalism to Ken Gilmorian "Evolutionary Creationism"; so they must now start to abandon their existing belief that God created the universe. Currently the Christadelphian champion of Evolutionary Creationism is still objecting to and denying up to date scientific thinking and making ill informed statements about the latest proposals by leading theoretical physicists and cosmologists. This is explainable by the fact that he (they) are not motivated by a genuine desire to understand science; but rather, like almost all Christadelphians, by a childhood conditioned instinct to defend their family religion and the treats that it promises to its adherents for the future age. But they must be beginning to sense that they may soon need to make another retreat from Biblical literalism (the Biblical claim that God created the universe) and be forced to accept that the Bible was either mistaken about the creation of the universe; or that it was not being literal when it made that claim. - Time for another "Accommodation" of Biblical error to scientific discovery. - Long live John Calvin who invented the ruse in the first place! "In medieval Europe, faithful believers needed to rethink their biblical interpretations about whether the earth was stationary (e.g., 1 Chronicles 16:30; Psalm 93:1) in the light of mounting scientific evidence. It is possible that believers today may have to do the same in their thinking about creation. In doing so, we need to be careful not to fall into the same trap as the Catholic church did in refusing to accept Galileo’s evidence because it didn’t fit their biblical interpretations." "I looked at our position on creation and evolution, and was persuaded by the arguments for evolution. I then tried to re-interpret Genesis (and some New Testament passages) in the light of this knowledge........................................... But then, quite suddenly, I could not think of a good reason to believe any more. Far from inspired, the Bible now appeared as a collection of ancient human documents, full of propaganda, legend, and bigotry.................................... My faith was always based on what I thought was evidence, and once the evidence was removed, the faith quickly followed." In the light of all of the above, it must be obvious that we shall soon be hearing the bugle call of retreat sounded from the Christadelphian academics who favour Evolutionary Creationism from a Christadelphian perspective. 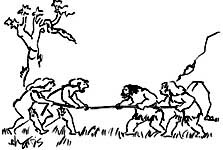 If they don't accept the newer findings and theories (supported by some of the most advanced mathematics in the world) propounded by leading scientists in the field, they will be exposed as anti-science Luddites similar to their old enemies the Christadelphian Young Earth Creationists. If they do accept these newer theories and thinking, they will need to scramble to stuff more shovels of fudge into Genesis and numerous other Bible passages that make the claim that God created the universe. - It will all require re-interpretation to conceal its basic error. Just as they now claim that God used Evolution to create the different species of living organisms, Evolutionary Creationist will soon be telling us that God used the natural and spontaneous creation of the universe (or contraction of a previous universe) for his purpose of creation. But wait a minute: is it really "Creation" if the universe can come into existence on its own, life can come into existence as a result of natural physical and biological processes, species can Evolve and differentiate by a bottom up process of unknowing natural design and humans can evolve from a common ancestor with the Chimpanzee? Evolutionary Creationism from a Christadelphian perspective can only be pushed so far. It is a finger in the dyke trying to stop the floodwater of truth. Every few decades more fingers have to be pushed into more holes in the dyke, as the relentless advancement of science and human understanding causes more leaks of truth to pour forth. 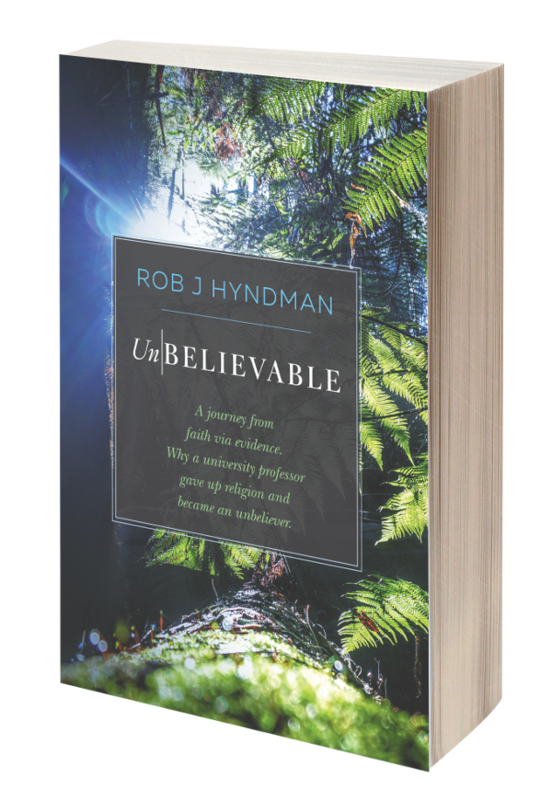 At what point in this 500 year retreat from Biblical literalism and fundamentalism does an intelligent mind finally conclude (as did Rob Hyndman) that not only is the Bible not literal about most of what it says, but it is also not true? And if it's not true, God could not have inspired the Bible. And if God did not inspire the Bible...........................there is no God.